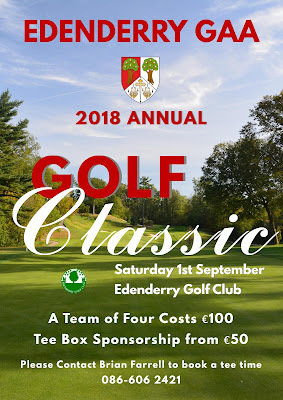 The Annual Edenderry GAA Golf Classic will be held on 1st September in Edenderry Golf Club. This event has been very successful in recent years and has proved to be a great social event for all players, past and present to come together and enjoy a round of golf in aid of a good cause. Slots will be filling up quickly so to ensure you confirm your place contact BRIAN FARRELL 086 606 2421 to book your team of four for €100. You can also sponsor a Tee Bank for €50.